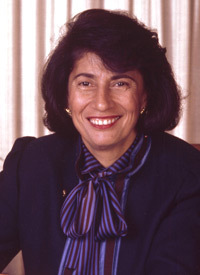 Evelyn Handler was the first woman to serve as president of Brandeis. Notable achievements during her tenure include the initiation of the Volen Center for Complex Systems, the strengthening of life sciences at the university, admission to the Association of American Universities and founding membership in the University Athletic Association. Handler earned a bachelor’s degree from Hunter College and master’s and doctoral degrees from New York University. An expert in myelogenous leukemia, she earned a law degree from Franklin Pierce Law Center. Handler died tragically on Dec. 23, 2011, when she was struck by an automobile as she crossed a street in Bedford, NH. She was 78 years old.